Beautiful home, 5 bedrooms, 3.5 baths, near ocean, pool, tennis, sleeps 10 . THIS IS A FAMILY ORIENTED RESORT, NO SENIOR HIGH SCHOOL RENTALS! PLEASE INCLUDE YOUR TELEPHONE NUMBER WHEN INQUIRING. Vacation in style!! Make your reservations for the 2019 Season at the prestigious and spectacular Bayside Resort. Just released six weeks for the 2019 Season!! Prestigious Bayside Resort Community in Ocean City, MD., a place you'll bring your family and friends year after year. 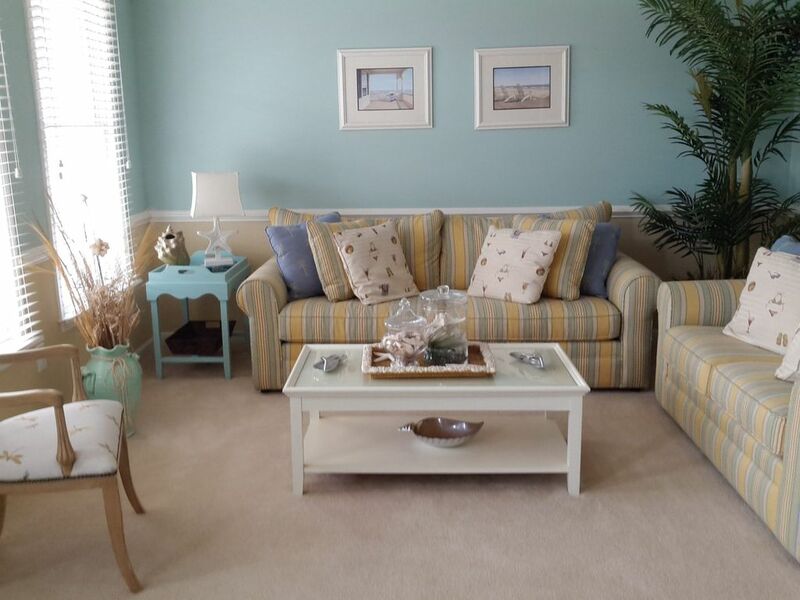 This stunning family oriented community overlooks Assateague Island, conly a few minutes drive to Assateague National Seashore and Ocean City famous boardwalk and beach. Close to Frontier Park water and sports, the outlets, Malls, churches, grocery stores, pharmacies, movies, golf, restaurants, water park, marina, parasailing, jetski, kayaking, deepsea fishing, put-put golf, many recreational activities & miles of sandy beaches. The clubhouse features state-of-the art fitness center, game room, TV, indoor/outdoor pools, social room, kitchen, tennis & basketball courts, tot lot, nature trails, crabbing pier, fishing ponds and kayak dock. This house is not your typical rental; it is meticulous kept by owner who gives personal attention to every detail in the house. The house has been professioanlly decorated, features five bedrooms, ( 4 bedrooms w. queen beds and one w. twin beds), 3 1/2 bathrooms, home, with spacious family room, sunny breakfast bar & nook, gourmet fully equipped kitchen, formal dining/living rooms, large patio, porch, balcony, TVs, cable, DVD, VCR, games, movies and laundry room on 2nd fl. Wireless internet at the house and WiFi at club house. JUST BRING YOUR LINENS, AND TOWELS. WE DON'T RENT FOR SENIOR WEEK OR ANYONE UNDER 25. Conveniently located near the ocean with gorgeous views of the Sinepuxent Bay, Assateague Island and the Atlantic Ocean, and miles of unobstructed fine, white sandy beaches, Ocean City offers something for everyone. - For nature lovers, Assateague Island is near by, a natural treasure of barrier island life featuring Assateague's famous wild ponies wandering the beaches and trails of the island! We rent to families only. No GROUPS OR SENIOR Or COLLEGE WEEK rentals. MUST BE 26YRS. YOU MUST BE 26 YEARS OLD TO RENT. : Make this luxurious 4-bedroom,.loft, 3.5-bath home your next vacation retreat! Located just a short walk from Bayside Clubhouse,where you can enjoy the in/out door pools, fitness center, game room and the amenities the clubhouseoffer; this beautiful house has been kept in prestine condition with top of the line furniture and many high-end finishes. The spacious kitchen and dining areas will be certainly a popular spot for you and your guests. Unwind with a drink and a good book on one of 2 porches or back large flagstone patio where you can BBQ and enjoy the bay breeze. Close to Assateague and Ocean City beaches. All the conveniences of home are here, such as a full-size washer/dryer, TV, DVD, wireless internet, games, formal living & dining room, large family room, breakfast bar and eat-in kitchen.